A Valentine's Day Warm-Up This Saturday! Posted on February 7, 2013 at 4:14 pm. You may have heard me say this before, but some people have actually told me that max’s should be called the Valentine’s Day store given that we sell jewelry AND chocolate. While I’m not crazy about the name, I have to admit that I do love it that we’re so well prepared to be your one-stop destination for your Valentine’s Day shopping — or the shopping that someone is hopefully going to be doing for you! 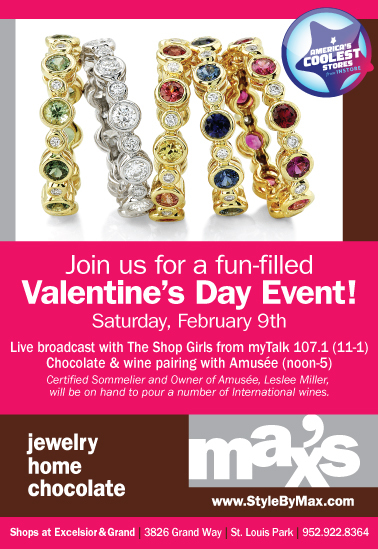 To get you in the mood for the big day, we’ve invited Allison Kaplan and Alexis Walsko, the fabulous ladies of The Shop Girls from MyTalk107.1, to join us on Saturday morning, February 9 for a live broadcast from the store. And wouldn’t it be nice to enjoy some of that chocolate that you might be buying for others or a tasty beverage while you’re looking for the perfect piece of sparkle for your Valentine? Uh huh, sure it would! So on the same day as the live broadcast, we’re going to have a chocolate and wine pairing event between noon-4 with Amusee. Amuesee’s owner and certified sommelier, Leslee Miller, will be on hand to pour and pair a number of international wines to with our artisanal chocolates. You don’t want to miss this one….it’s time to warm up before Saturday night’s snowfall and, more importantly, for Valentine’s Day! It’s all taking place this Saturday, February 9. Jewelry, chocolate, wine…..did I mention that Valentine’s Day is next week….??? ?